On Sale Now! Free Shipping Included! 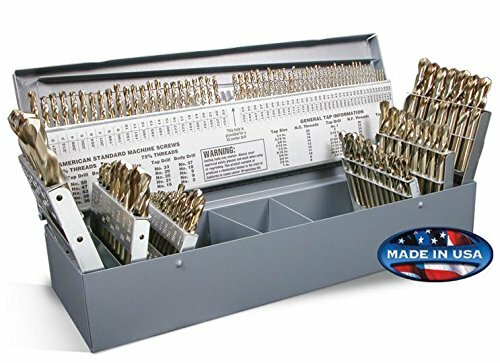 Save 2% on the Rocky Mountain Twist 95090880 Cobalt Combination Size Screw Machine Set, 135° Split Point Geometry, 1/16'' to 1/2'', A-Z, and #1-#60 Size Range, 115 Piece Set by Rocky Mountain Twist at In The National Interest. MPN: 95090880. Hurry! Limited time offer. Offer valid only while supplies last. Rocky Mountain Twist 95090880 Cobalt Combination Size Screw Machine Set comes with a rugged metal carrying case with tip-out storage indexes. Rocky Mountain Twist 95090880 Cobalt Combination Size Screw Machine Set comes with a rugged metal carrying case with tip-out storage indexes. Numbered indexes help keep bits organized. Drill bits from #1 to #52 are Split Point. 135° Split Point, 1/16" to 1/2", A-Z, and #1-#60, 115 Piece Set, 2-1/4"H x 4-5/8"W x 13-1/4"L.
If you have any questions about this product by Rocky Mountain Twist, contact us by completing and submitting the form below. If you are looking for a specif part number, please include it with your message.